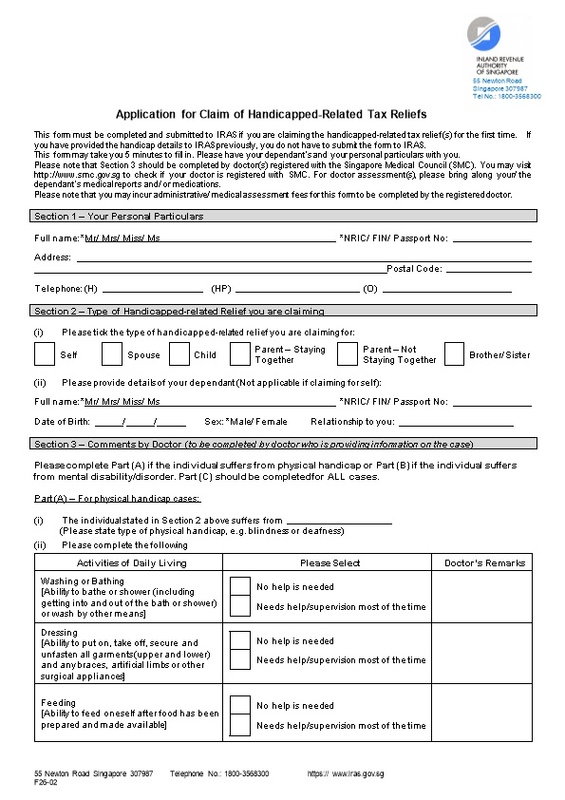 This form must be completed and submitted to IRASif you are claiming the handicapped-related tax relief(s) for the first time. If you have provided the handicap details to IRAS previously, you do not have to submit the form to IRAS. This form may take you 5 minutes to fill in. Please have yourdependant’s and your personal particulars with you. Please note that Section 3 should be completed by doctor(s) registered with the Singapore Medical Council (SMC). You may visit to check if your doctor is registered with SMC. For doctor assessment(s), please bring along your/ the dependant’s medical reports and/ or medications. Please note that you may incur administrative/ medical assessment fees for this form to be completed by the registered doctor. Please complete Part (A) if theindividual suffers from physical handicap or Part (B) if theindividual suffers from mental disability/disorder. Part(C) should be completed for ALL cases. Is the individual impaired in Self Care and Activities of Daily Living? Is the individual impaired in compliance to Psychiatric Treatment? Is the individual impaired in Education or Work? (i)The *mental/ physical handicap has commenced since (yyyy). (ii)The *mental/ physical handicap *is/ is not permanent. (iii)The status of *mental/ physical handicap is expected to change within ______years.